The Town of New Canaan, Departments of Inland Wetlands and Watercourses, Parks, Highway and Public Works are joining forces with the Chamber of Commerce and Planet New Canaan to organize New Canaan's Clean Your Mile. 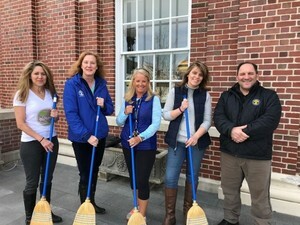 For the last several years, the Clean Your Mile effort has included three key components: New Canaan citizens individually tackling their neighborhoods; community groups scouring public spaces including parks and schools; and the Chamber's efforts with merchants to clean up sidewalks, storage areas and parking spaces surrounding the shops and restaurants. New this year, Planet New Canaan will be cleaning the Five Mile River area on River Street on Saturday, April 27 with Surfrider Foundation from 10:00 a.m. to 12 noon. Volunteers are welcome to join. Garbage bags are available at either the Public Works Department or Inland Wetlands at Town Hall. Dumpsters will be located in the train station commuter lot Friday-Sunday. In addition, Public Works can be contacted at 203-594-3054 for pickup of objects too large for volunteers to remove.